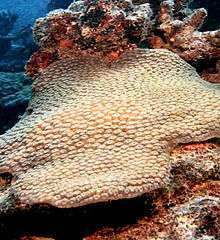 Astrocoeniids include both hermatypic and ahermatypic (reef-building) colonial corals, both with and without symbiotic zooxanthellae. The family is made up of both branching and encrusting species which can range in size from less than 5 cm (2.0 in) to more than 30 m (98 ft) across. 1 2 Vanden Berghe, Edward (2010). "Astrocoeniidae". World Register of Marine Species. Retrieved 2015-05-24. 1 2 Family Astrocoeniidae Classification of Scleractinian (Stony) Corals. Retrieved 2011-12-23.